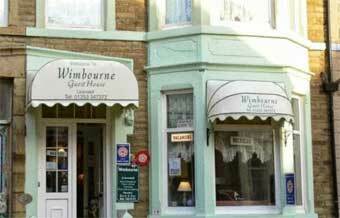 The Wimbourne is located just around the corner from Blackpool South Train Station and the Waterloo Road Tram Stop making it easy for shuttling between all the major attractions. This three-star bed and breakfast guest house on South Shore offers a quiet haven, close to Blackpool Pleasure Beach, football ground, the Promenade and the shops and markets of Waterloo Road, yet in a quiet backwater just a couple of minutes back from the beach. Josie, the resident chef prides herself on her tasty home cooked food, and the friendly atmosphere keeps guests coming back to the guest house time and again. The Guest House boasts a three-star rating and all six bedrooms are clean and well presented with en-suite or private bathrooms, complimentary tea and coffee, plus Freeview television. There are some spacious family bedrooms that sleep 5 (with interconnecting options). The Wimbourne's onsite bar is well stocked including draft lager and bitter. There are also a range of games for the children. A Full English breakfast is served daily in the dining room and special diets are catered for if notified in advance. Telephone the owners of the Wimbourne on +44 (0)1253 347272 for more details.